WASHINGTON (CN) – Supreme Court nominee Neil Gorsuch assured senators Monday he would be nonpartisan, independent and fair if confirmed to replace the late Justice Antonin Scalia, pushing back against Democratic claims that he supports corporations and special interests from the bench. 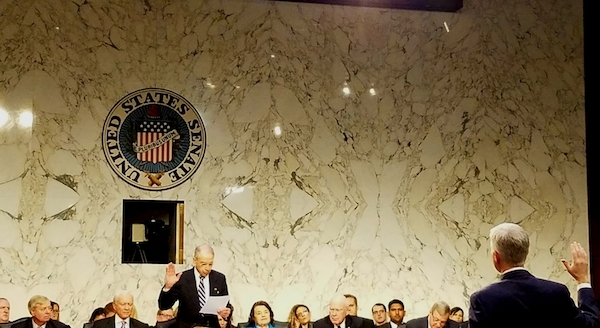 The 10th Circuit judge’s remarks this afternoon concluded a four-hour session of the Senate Judiciary Committee that was dominated by statements from senators that drew the lines along which they would grill Gorsuch when the hearing opens for questions on Tuesday. Addressing the committee for less than 20 minutes, Gorsuch spoke about his family and upbringing, and detailed the origins of his legal theory. The latter he said requires him to decide the laws as written, not interpret them as he might like them to be. Gorsuch’s statement came after a host of Democratic senators used 10-minute allotments of time to decry the judge as a sterling partisan who would advance Republican interests on the Supreme Court, inexorably tied to President Donald Trump, who nominated him for the position in January. Attempting to flip this narrative, Gorsuch said the decisions he reaches are “the ones the law requires,” and not based on ideology. Appointed to the bench by George W. Bush, Gorsuch listed as his “legal heroes” Justice Byron White, a John F. Kennedy appointee; Justice Robert H. Jackson, whom Franklin Delano Roosevelt put on the court; and Scalia, a Reagan appointee whose seat Gorsuch hopes to fill. Gorsuch has been closely compared to Scalia since his nomination. Though he said each of those justices taught him something about the law, Gorsuch noted that he did not completely agree with any of them, even Scalia. “Sitting here I am acutely aware of my own imperfections, but I pledge to each of you and the American people that if I am confirmed I will do all in my power to commit to be a faithful servant to the constitution and laws of this great nation,” Gorsuch said in his opening remarks. Democrats also claimed throughout their statements that Gorsuch has routinely sided against “the little guy” in his rulings and in favor of corporations. An especially popular reference for detractors was a dissenting opinion Gorsuch wrote in TransAm Trucking Inc. v. Admin Review Board, where Gorsuch argued a company should be able to fire a trucker who abandoned his trailer against the company’s orders to escape the freezing cold. Gorsuch wrote at the time that there was no law that stopped the company from firing the trucker. While he didn’t directly mention the case during his statements Monday, Gorsuch defended his record by saying he has sided for an against all classes of people and businesses in his time on the bench. The committee is set to reconvene on Tuesday morning, when senators will have a chance to question Gorsuch in 30-minute rounds.